A new venture for the Canton Historical Museum in Collinsville to raise money to benefit the museum building fund,was to hold a "Gallery of Trees". Any group, business or individual was invited to enter a tree. A Gala was held to start things off and then we sold tickets for the "tea-cup auction" of the trees on December 12. Cawasa Grange's entry titled "NO FARMERS, NO FOOD" featured sheaves of wheat, fruit and many farm animals - there was even a little red train. Ironically, we won our own tree. It would have looked nice in the living room at 21 Thayer Avenue, but we had a better idea. Why not bring it to one of our most faithful Grangers. Vivian Shaw was delighted to receive the tree and Lyall was glad he didn't have to go out and get one. 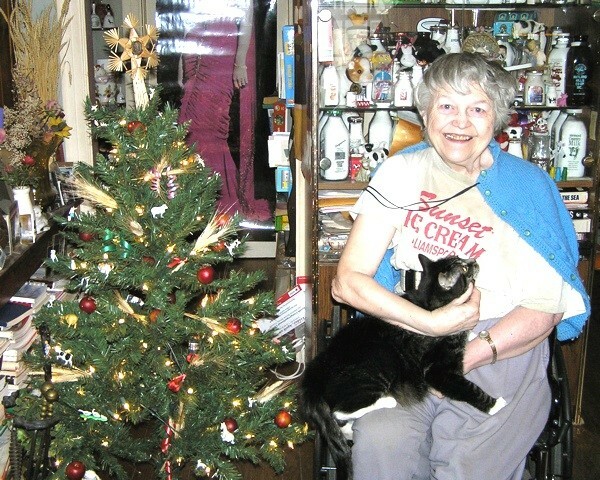 Before a stroke confined her to a wheelchair, Vivian was a very active and devoted Granger. She knew the ritual in several degrees, is a past master of Farmington Valley Pomona and was one of the installing officers on the Farmington Valley Pomona Installing Team. 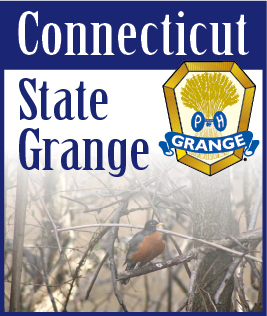 She held offices including Flora of the Connecticut State Grange and was in charge of the Art Department at the Connecticut Agricultural Fair for several years. Could we have chosen a better person to receive our tree? We don't think so.